Gardeners tend tomato plants throughout the growing season to encourage the growth of the largest and plumpest tomatoes. To give your tomatoes a boost through the summer, incorporate eggshells when planting the tomato plants in the spring. The eggshells provide beneficial calcium for your growing tomato plants and help prevent blossom end rot. Save eggshells throughout the winter so you will have enough for each tomato plant when it is time for spring planting. You will need approximately 12 crushed eggshells for each tomato plant. Collect the empty eggshells in the bucket as you use the eggs. Prepare the planting area for the tomatoes in the spring when all threat of frost is over. Cultivate the soil with the garden spade down to a depth of 6 to 8 inches. Add 2 inches of compost to the top of the soil and work this in to the soil with the garden spade. Dig holes for the tomato plants. Make the holes 2 to 3 feet apart and dig the holes approximately 8 inches deep. Crush the eggshells in the bucket so they are in fine pieces approximately ¼-inch to ½-inch in diameter. Add 12 crushed eggshells to the bottom of each prepared hole. Add two to three handfuls of soil to the eggshells and toss the soil and eggshells lightly to mix them. Remove the tomato plants from their temporary containers and place them into the prepared holes. Situate the tomato plants in the holes so the bottom set of leaves is just above the soil level. Fill soil in around the roots of the tomato plants. 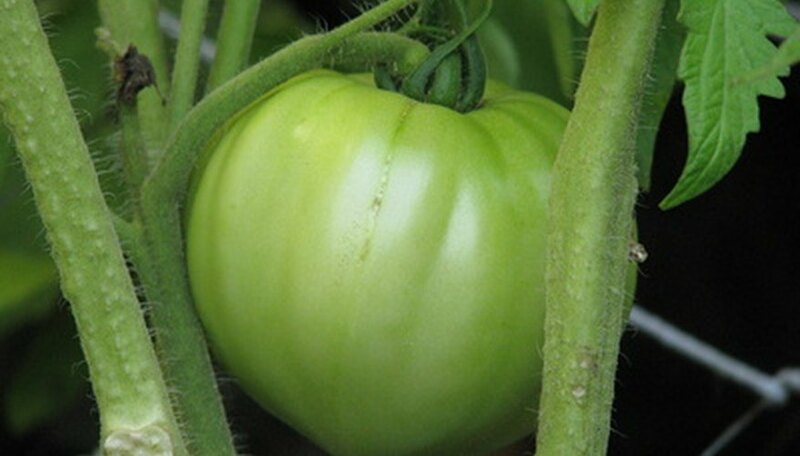 Water the tomato plants generously immediately after you plant them. Water the plants to saturate the soil evenly around the plants, but do not water to the point of puddles forming.